TESCO stores hypermarket chain, the world's third largest retailer, opened its 36th outlet in the country on Monday, in Seremban 2. The new RM107 million Tesco Extra replaced its old outlet, located a few metres away, with a much bigger building covering 15000 sq m to accommodate the growing demand in Seremban, Negri Sembilan. Mentri Besar Datuk Seri Mohamad Hasan, who officiated at the opening ceremony, said the state government is pleased with foreign investors, especially hypermarkets giants like Tesco, opening up their stores in the state as they provide customers a wide range of products at low prices. "There will be two more outlet openings soon in Senawang and Nilai and another approved project in Lukut, Port Dickson, with close to RM500 million investment in total," he said. "I hope Tesco would consider opening stores in places such as Bahau to allow the people at the outskirts to enjoy hypermarket experience in their neighbourhood," he added in his speech. Also present was Tesco Stores (Malaysia) Sdn Bhd chief executive officer Tjeerd Jegen. Mohamad said small and medium entreprises are protected despite the entry of foreign retailers, as close to 85 per cent of the products sold at Tesco are local products. "We want to ensure local industries are protected and not left behind," he said. 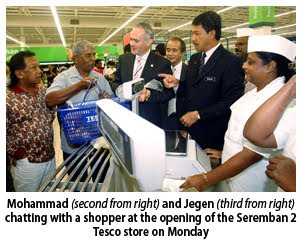 Jegen, who has been in the country for seven months, said the opening of the new store in Seremban had a special meaning to Tesco Malaysia as it is the birthplace of hypermarket's first ever Extra format. "Tesco Extra is a completely new format to not only Tesco in Malaysia but also the group worldwide. "The format supports and caters to the wider needs of small businesses apart from our end-user customers," he said, adding that the total overall direct investment in Malaysia has surpassed the RM4 billion mark. Jegen said the new outlet boasts a new food court, a play area, 90 tenants and restaurants, more than 60,000 lines of products and 1200 parking lots. "The store also provides close to 1,000 job opportunites as well as cares for the environment with 20 per cent less carbon emission with less use of air-conditioning and energy-efficient lighting. "We hope to reduce carbon emission by 50 per cent in 2020 and become carbon-neutral by 2050," he said. Jegen added that Tesco has created more than 13,000 jobs since its inception in 2001 and hopes to open more stores in the country in the near future.